The village of Beckemeyer, originally known as Buxton, was settled by coal miners who were mainly immigrants from the northern part of Germany. 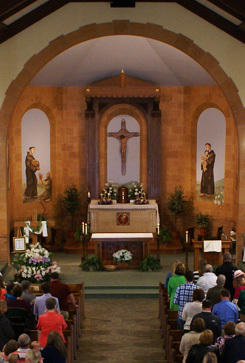 St. Anthony of Padua parish was formed in 1905 to serve the needs of the Catholic residents. On October 2, 1905, Father Joseph Hoellmann received his orders to build a combined church and school building. In December 1905 St. Anthony’s was dedicated by Bishop John Janssen, first Bishop of Belleville with Father Joseph Hoellmann as founding pastor. The original church was a two-story brick structure and the first floor provided classrooms for the parish school and the second floor seated 224 for worship services. By 1927 the Catholic population had grown to a point of needing a larger worship space so the foundation was laid for a new church. A very attractive plan following the Spanish Mission style of architecture was adopted. With the closing of the coal mine in 1928, many people were thrown into unemployment. Building operations were suspended due to lack of funds and delayed its completion and dedication until November 1938. A new rectory was built in 1950, designed to harmonize with the church. St. Anthony’s School was served by the Poor Handmaids of Jesus Christ from 1906 until its closing in the 1993-94 school year, when it consolidated with All Saints Academy. Catholic education is now a collaborative effort. Catholic elementary school is provided by All Saints Academy, Breese, and Catholic secondary education is available at Mater Dei High School, Breese. 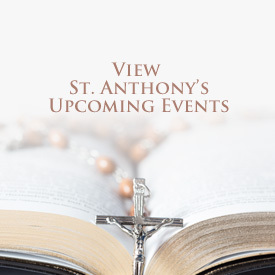 For students attending District 12 elementary, St. Anthony shares the Youth Faith Formation with St. Augustine and St. Dominic in Breese. St. Anthony’s first parish hall was built in 1909 and enlarged in 1923 with the addition of bowling alleys. In later years, the bowling alleys were replaced by a kitchen and meeting room. Ground was broken in 1977 for a new parish center which includes a gym, cafeteria, classroom, restrooms and shower rooms. It was dedicated in October 24, 1978. Within this context, the parish remembers those ancestors, who built both the original parish in 1905 and the present St. Anthony of Padua Church in 1938. 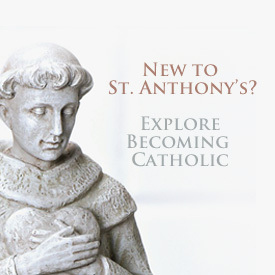 St. Anthony’s mission statement, “continuing to create a future together” allows the community to reflect on the past, recognize the present and contemplate the future.